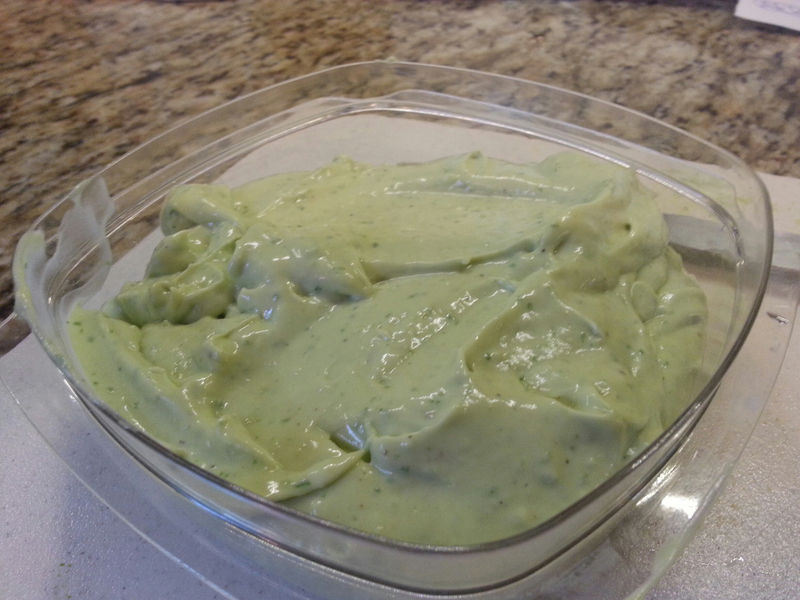 This is a fantastic creamy avocado dressing or dip! It is very simple to throw together thanks to my food processor. Possibly by using a probiotic yogurt, by some magic, it stayed as green as the photo for a week. Though, I’d only eat it probably the first 4 days to be safe. I’m pretty sure I cut the garlic in half. The fresh parsley is from our garden. It is extremely good, has healthy fats, and not as fattening as other dressings. One recipe amount is shown in the photo, not doubled. Highly recommended! NOTES: I’d omit the dry mustard to make it IC safe. Also onions are a known irritant, so please tread with caution. I can tolerate a little onion powder, personally (for now). To make the dressing, place the avocado, buttermilk, garlic, and seasonings in a blender or food processor. Blend and your dressing is ready. 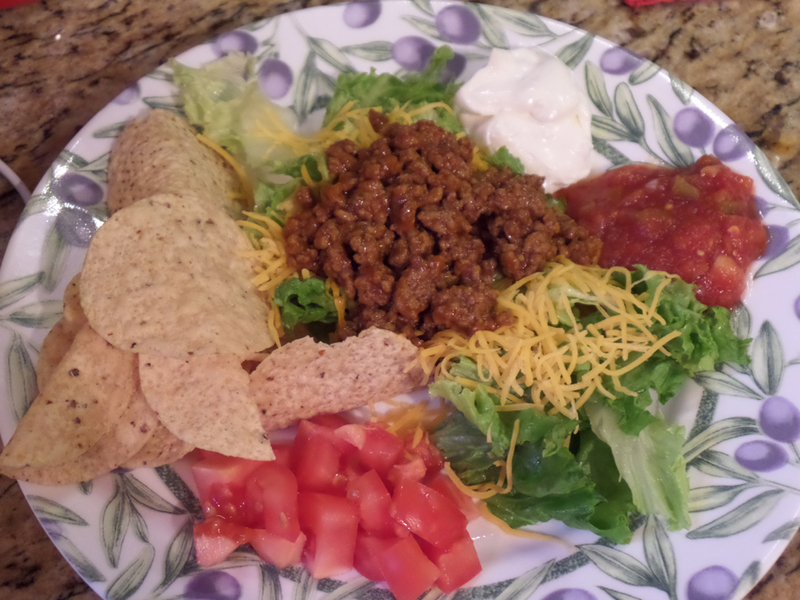 I had always wanted to try a taco salad and this easy recipe fit the bill. I halved the recipe, omitted the onion, olives, and Jalapenos (all health or personal taste reasons) and it was perfect for our family. It was simple to throw together, enjoy! Brown ground beef in a large skillet over medium heat until crumbly and no longer pink, about 10 minutes; drain excess grease. Mix in taco seasoning mix and water. Bring the beef mixture to a boil and cook until thickened, about 10 more minutes. Transfer beef to a serving bowl. Place chopped onion, lettuce, cherry tomatoes, Cheddar cheese, black olives, salsa, jalapeno peppers, sour cream, and corn chips in individual serving bowls. Allow diners to assemble their own salads from the ingredients. In an ongoing effort to save money on groceries (haha, what a good joke), I rented a book from the library entitled, “Family Feasts for $75 Per Week: A Penny-wise Mom Shares Her Recipe for Cutting Hundreds from Your Monthly Food Bill” by Mary Ostyn. I copied a few pages, one of which was “Greek Dressing” page 267. It was super easy to put together and did not involve a food processor, just shaking. *Most salad dressings with a high vinegar content will easily last in the fridge 2 months, but sniff it each time. You can always halve this. I poured the mixture into my Ball brand Mason jar when I was done mixing. A+ authentic flavor! Combine all ingredients in a pint-size container with a tight-fitting lid. Shake well. Store, tightly covered, in fridge up to 2 months. This recipe is from “Cook This, Not That” Cookbook (2010), which I got from the library. This salad is A+! Instead of T.G.I. Friday’s Sante Fe Chopped salad, which has 1,800 calories! !, they came up with this similar recipe that saves 1,460 calories! I loved this salad so much I need to make it soon! Even though I omitted the onion, jalapeno, and the chipotle pepper, I found it so tasty! Preheat the oven to 400° F. Place the tortilla strips on a baking sheet and bake for 8-10 mins, until lightly brown and crispy. Set aside. 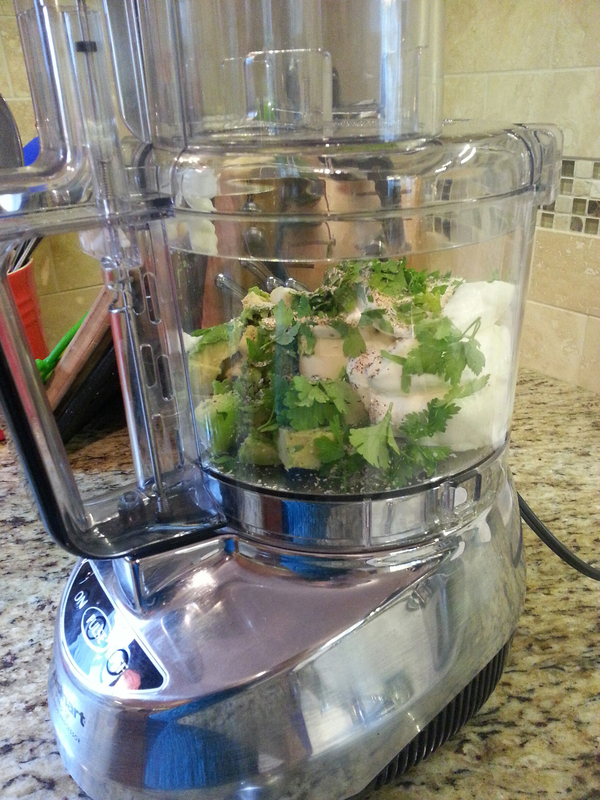 In mixing bowl, combine the tomatoes, onion, jalapeno, cilantro, and half the lime juice. Set the salsa aside. Preheat a grill or grill pan. Season the steak with salt and pepper. Once the grill or grill pan is heated, toss on the steak. Cook for 4-5 minutes per side, depending on thickness, until firm but yielding. Let the steak rest for 5 mins before slicing it thinly against the grain of meat. 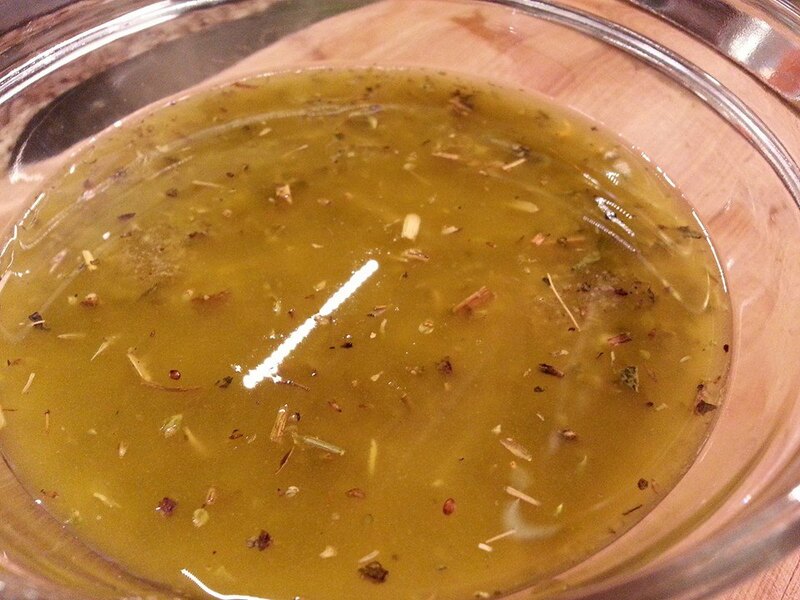 Combine the remaining lime juice with the vinegar, chipotle, and honey. Slowly drizzle in the olive oil, whisking to combine. Toss the lettuce with enough vinaigrette to lightly coat, then divide among 4 plates. 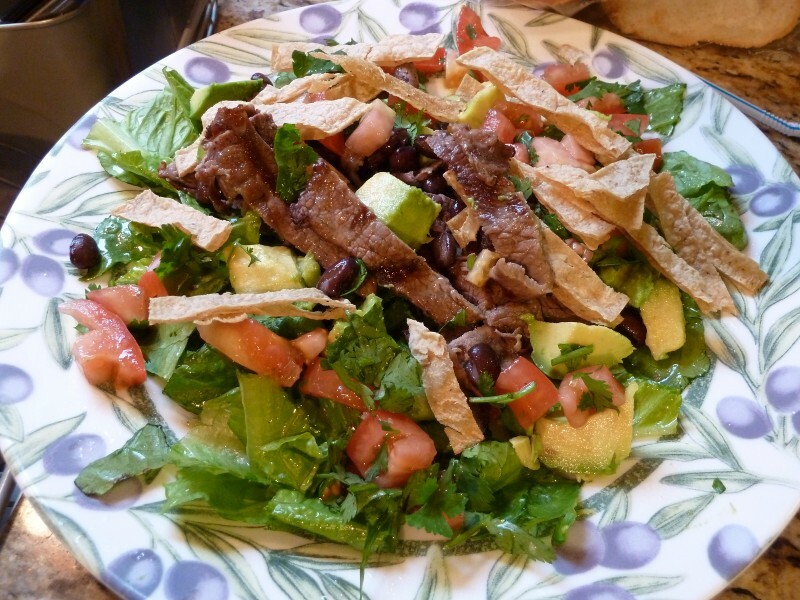 Top each serving with slices of steak, black beans, avocado, salsa, and a few tortilla strips. This is a wonderful recipe I acquired from Chef Kate, a local chef who appears at the library for cooking classes. It’s a wonderful healthy mix of good ingredients for your body! The only changes I made were to substitute feta for the blue cheese and omit raw onion. I made the avocado dressing and will post that in a separate post – it was so yummy, I will make that dressing all by itself again! For an event, I made double the salad and one recipe of the salad dressing. It was a very good amount of food! I love the mix of beans, cheese, and crunchy and soft textures. 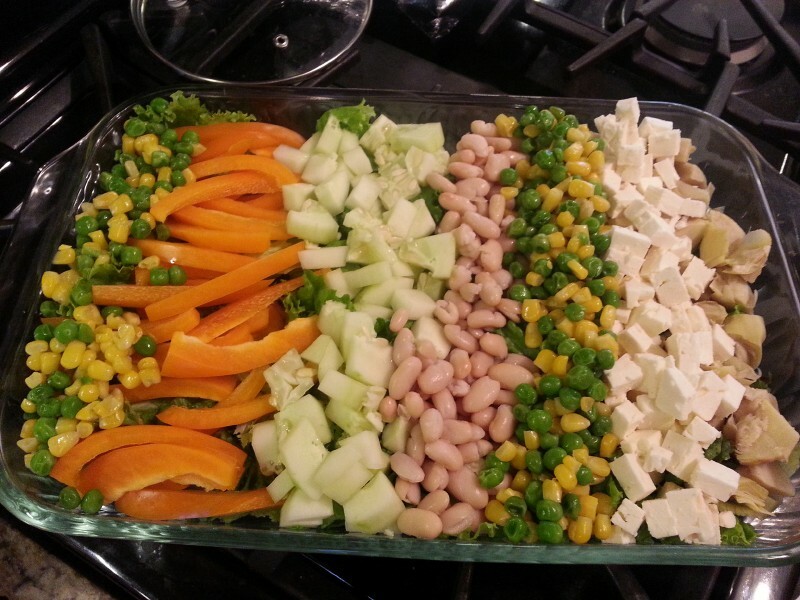 It’s a tasty and attractive salad that is easy to prepare! If you want it with the avocado salad dressing complement, click here. 1.) In a small saucepan, cook the peas and corn. If the corn is on the cob, just slice it off with a sharp knife. Once cooked, drain and set them aside. 2.) I lined my plates with lettuce and piled up the vegetables as I cut them. You could place all the vegetables in a large bowl, toss them together and than place them on the beds of lettuce. 3.) Crumble the cheese over the vegetables, divide the beans on top, drizzle with dressing and serve.